General operating policies and procedures have been established to insure the Newnan Convention Center Authority, its personnel, Licensees and related service industries are working in a safe and orderly environment. These policies and procedures should serve as a guideline for all concerned and will be enforced by Newnan Convention Center Authority management. The Newnan Convention Center Authority will tentatively reserve dates for a period of up to seven (7) days.At that time, the prospective client must either confirm the date with a deposit and signed agreement or release the date. A date is not considered confirmed until the Client has submitted the required deposit and signed contract to the Newnan Convention Center Authority office. Deposits for dates are not refundable unless the date can be re-booked to another Client and cancellation notice is given at least 60 days prior to event date. A deposit of the base rent is required at the time a license is executed.An additional deposit may be required for anticipated advance expenditures. The balance of the rental fee and any additional expenses is due and payable in the office of the Newnan Convention Center Authority five business days prior to the event date. Parking is available in the Newnan Convention Center Authority parking area. Any other method of payment must be approved in advance by the Director. All services are provided on a C.O.D. basis and must be paid in full five business days prior to the event. Decorations must be approved prior to being attached to any surface. The only approved methods of attachment are masking tape or ultra-thin pins. No confetti or glitter is allowed. Animals and pets are not permitted except in conjunction with an approved exhibit, display or performance legitimately requiring use of animals. Seeing Eye dogs are permitted. Newnan Convention Center Authority permanent graphics, signs, or displays may not be visibly blocked in any manner, nor may temporary signs or decorations be attached to permanent building graphics. Planters and furniture in public areas, gallerias, ramp ways, etc., may not be removed or repositioned. The Newnan Convention Center Authority official caterers must provide all food and beverage services within the Newnan Centre. Food and Beverage in conjunction with specific exhibits must be approved in writing by the Centre Management. Damage to the Centre’s property or equipment shall be the responsibility of the Licensee and/or the person or organization causing such damage. Show Management and service contractors are invited to inspect licensed areas prior to move-in and following move-out. Damages should be reported immediately to the Newnan Convention Center Authority Management. Banners, overhead signs, and special decorations may not be hung from Meeting Room Ceilings or walls without approval from Newnan Convention Center Authority personnel only. Movement of portable walls is to be accomplished by Newnan Convention Center Authority personnel only. House lighting, ventilation, heat or air conditioning will be provided as required during open show times. Energy conservation is of prime concern and minimal light and comfort levels will be maintained during move-in and move-out periods. Licensee is responsible for complete security within Meeting Rooms, Lobbies, Parking Lots and all other areas specifically permitted from the time of initial occupancy until completion of move-out. Such security, when required will be at the expense of the Licensee. All security arrangements are subject to approval by Newnan Convention Center Authority Management. Areas within the Newnan Convention Center Authority identified “Authorized Personnel Only” are restricted to Newnan Convention Center Authority personnel. Exterior exhibit hall exit doors and loading dock exit doors are not to be propped open. Automatic closing devices are not to be removed or tampered with. Abusive language, threats, assault, vandalism, theft and all other inappropriate actions will result in immediate removal from the premises and prosecution if appropriate. No soliciting is permitted in the Newnan Centre. Safety of all occupants of the Newnan Centre is of utmost concern. Any and all unsafe conditions or activities will be brought to the attention of the responsible parties and corrective measures are to be made immediately. Absolutely no drinking of alcoholic beverages. No horseplay, practical jokes, etc. Use or possession of illegal or controlled substances of any kind is prohibited; violators will be prosecuted. No speeding or reckless use of vehicles or equipment will be permitted. No gasoline, kerosene, diesel fuel or other flammable liquids may be stored, permanently or temporarily, in hazardous work areas. No re-fueling activity of any kind permitted. Re-fueling must be accomplished a minimum of fifty (50) feet beyond the exterior of the building. Exit doors may not be blocked with freight, equipment, display material, etc. In general, any and all unsafe condition or activity is to be corrected promptly. Safety is of primary concern in designated hazardous work areas. All activities utilizing public areas, such as registration, special exhibits or displays, etc., must be approved in advance. Detailed floor plans with specifications are to be submitted to the Director for approval. Activities in public areas must take into consideration the requirements of other tenants utilizing the facility. Service desks and related “behind the scenes” work stations should not be set in public areas. Motorized vehicles, forklifts, gas or electric carts, etc., may not be operated in the ballroom, ramp ways, or any carpeted areas of the Newnan Centre. Installation of temporary floor coverings over permanent carpet must be approved in advance. Heat tape and double face tape may not be used on permanent carpet. Clear access must be maintained to all permanent displays located in galleria areas. No parking in fire lanes, service streets, vacant meeting space, loading dock areas of any other locations posted “no parking,” will be strictly enforced. Unauthorized vehicles will be removed at owner’s expense. Show management and other VIP Parking may be arranged through the Director. Crate storage is not permitted in the interior building areas under any circumstances. Refer to fire regulations for specific crate storage information. All labor requirements for move-in, move-out, set up of display area, etc. shall be the responsibility of show management/ and/or exhibitors and their service contractors. The Newnan Convention Center Authority serves as its own electrical and utility contractor. Refer to separate rate and service schedules for details. All items to be suspended from ceilings, including signs, displays, light and sound equipment, etc., must be approved in advance through the Director. Rigging of cable and other hanging devices on or near ceiling, electrical buss ducts and conduits is strictly prohibited. All ceiling equipment, material, and rigging must be removed immediately upon close of the show. Tape removal from floors is the responsibility of the Licensee. Clear access is to be maintained to restrooms at all times. Licensee and their service contractors are responsible for removal of bulk trash, crates, pallets, packing material, lumber, etc. prior to show opening and following move-out. Additional trash hauls due to show trash removal shall be the responsibility of the Licensee. Detailed floor plans for tradeshows and registration or special activities and exhibits scheduled in any public areas of the Newnan Centre, including exhibits located in Meeting Rooms and prefunction space are required to be submitted. Three copies of the proposed floor plan must be submitted to the office of the Newnan Convention Center Authority Director at least 60 days prior to the event. These plans must be approved by the Fire Marshal and the Newnan Convention Center Authority Director. Clients are instructed not to assume that their floor plan is acceptable until they have received a copy of the plan bearing the signature of approval by the Newnan Convention Center Authority Director. (A) Official name of the show, sponsoring organizations, rates, and name of service contractor. (B) All plans should be drawn to scale. (C) Aisle widths should be clearly indicated. (D) Primary entrance doors and emergency exits should be readily determined. (E) Service contractor storage areas should be clearly marked if located on floor. (F) Distinction between pipe and drape or hardware should be indicated. (H) Temporary exhibit floor food service areas should be clearly indicated. Show management, exhibitors, service contractors, and all other involved parties must comply with all Federal, State, and Municipal fire codes which apply to places of public assembly. Sections of the Life Safety Code Book which are pertinent to places of public assembly shall be considered a part of all Licensees, whether specifically referenced or not. Reference Copies of the Life Safety Codes are available in the Events Coordinator’s Office. All drapes, curtains, table coverings and skirts, carpet, or any materials used in exhibits must be flame retardant. All such material is subject to inspection and flame testing by the Fire Marshall. Firefighting and emergency equipment may not be hidden or obstructed, including fire extinguishers, fire hose cabinets, and fire alarm pull stations. Crates, wooden boxes, packing material, etc., may not be stored in meeting rooms, or exit areas. Crate storage is the responsibility of the appropriate services contractor of Licensee. Crates or show equipment may not be stored in service areas. Under no circumstances will crate storage or equipment storage be permitted to obstruct emergency exits from any area of the building. This requirement will be strictly enforced. Crate storage is considered a potentially hazardous situation and service contractors should submit all crate storage plans to the Director for approval. Vehicles with gasoline engines may be displayed with a maximum of two (2) gallons of gas remaining in the tank. A locking gas cap must be installed or the tank must be adequately sealed by tape or in some other appropriate manner. All battery cables must be disconnected and taped to avoid potential sparks. All electrical equipment must be UL approved and all gasoline engines must be AGA approved. Refer to electrical and utility rate schedules for detailed electrical, gas, water, and compressed air requirements for exhibits. All emergency exits, hallways, and aisles leading from the building are to be kept clear and unobstructed. Vehicles in fire lanes, or blocking exits, etc., will be removed at owner’s expense. The Newnan Centre can be utilized in different configurations for various types of events. Non-profits organizations are eligible to receive a 20% discount off the published rates upon providing the Newnan Centre with their State of Georgia letter granting their 501 (c) 3 status. 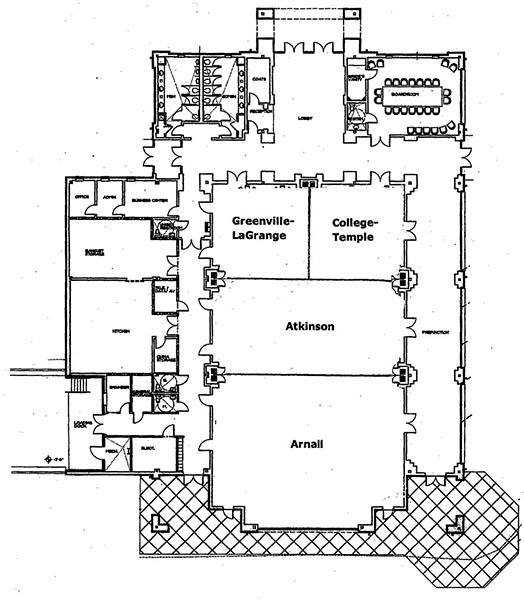 See image to the right for ballroom layout.